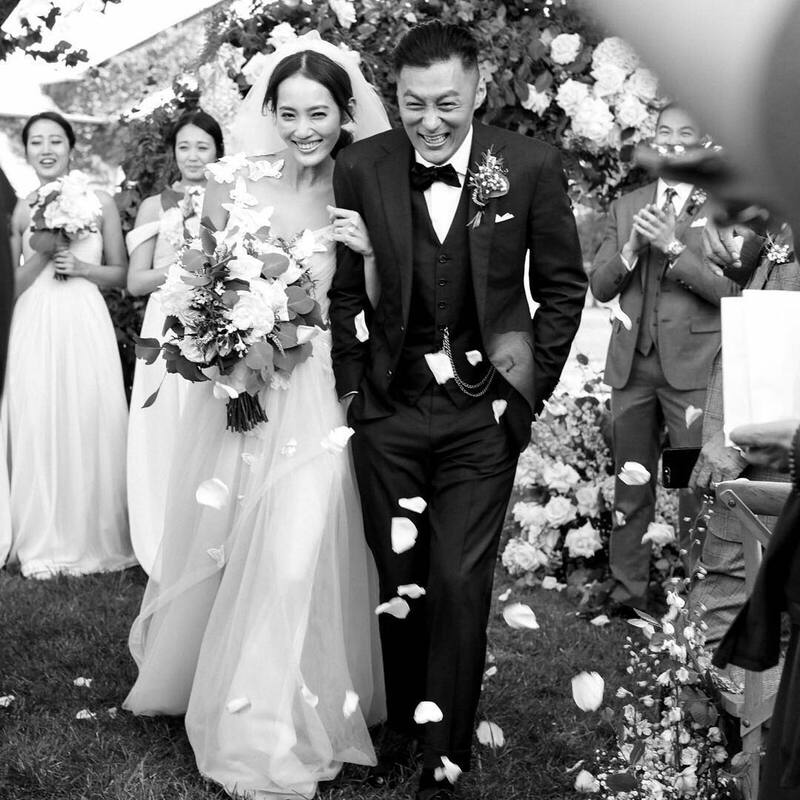 On Tuesday, 36-year-old Hong Kong actor Shawn Yue (余文樂) and 29-year-old model Sarah Wang (王棠云), daughter of a Taiwanese “leather belt magnate”, dropped a surprise announcement that they have officially tied the knot. The couple of one year revealed the happy news on their respective social media accounts, sharing wedding portraits. The couple of one year held their secretive, low profile wedding in Melbourne, Australia earlier this week. Close family and friends were invited, including Taiwanese actor Eddie Peng (彭于晏) and Mainland Chinese actor Hu Ge (胡歌). Though the wedding was meant to be private, Sarah’s close friends already knew about the Melbourne wedding a week in advance. They were prepared to give appropriate answers when asked by reporters. Despite the secrecy, the couple did drop hints here and there about an upcoming wedding—on November 20th, Sarah shared a picture of her and her girlfriends, perhaps discussing wedding plans. In October, Shawn was spotted in Taipei, perhaps to visit Sarah’s parents. Sarah’s agency was unaware about their wedding plans. The wedding, however, did not take them by surprise. Sarah’s manager explained that they were expecting Sarah and Shawn to get married eventually. The couple have already requested a ten-day vacation from their agency, and it is believed that they would go to Italy for their honeymoon. 8 comments to [Celebrity Weddings] Shawn Yue and Sarah Wang Are Married! Wow. I’m really shocked about this news because I always thought he’s a single guy or a bachelor guy however you called it. So the couple dated one year only and decided to tied the knot? Shawn is a lucky guy congratulations. This is surprising.. didn’t even know he was dating this girl. Good luck to her.. He has met someone, this being Sarah that has now completed his life and making him find true love. Sarah is absolutely blessed to find Shawn that will love her and take care of her as she had wished. They seem like a beautiful and loving couple. Their wedding was completely hush hush! I actually live in Melbourne and did not hear anything at all about this. They did well in keeping it super low key. 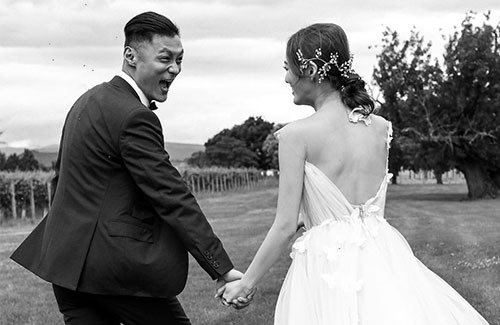 It looks like they got married in Yarra Valley ( which is the winery region of Victoria). Its great they chose Melbourne as a place to get married, maybe because its not a place where high profile celebrities would select like UK, Europe or the Asian islands like Bali which so many have had their weddings. Sometimes simple is always the best. I wonder if they will settle down in Hong Kong or if Shawn would move to Taiwan? I’ve never even heard of Sarah Wang – she must be a mediocre model in Taiwan. Does anyone know any history about her (besides the details of her dad and the leather belt business)? Nice wedding. They look very happy together. I wonder where they got married as Victoria has been flooding in the past few weeks. They married on 20 November, so they missed the thunderstorms that hit Melbourne and rest of Victoria on the weekend of 1-3 December.